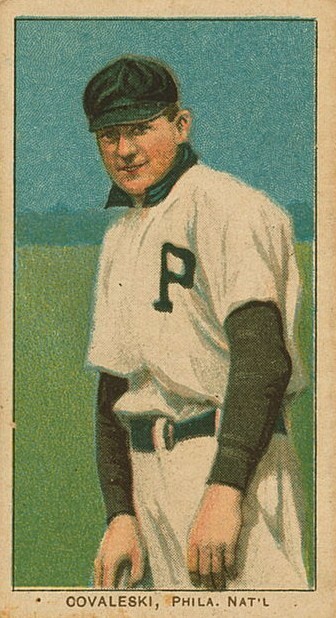 Several years before his younger brother Stanley embarked on a Hall of Fame career, Harry Coveleski established the family name as the "Giant Killer" who, as an unheralded rookie with the Philadelphia Phillies, defeated the New York Giants three times in five days to deny John McGraw's squad the 1908 NL pennant. A few years after his auspicious debut, however, the left-handed Coveleski had drifted out of the major leagues and become an object lesson in the unpredictable vagaries of the sport; his case "frequently cited as that of a player who had showed excellent promise only to prove a flivver," according to Baseball Magazine. But with a rising fastball, sharp-breaking curve, and an endurance first developed working in the coal mines of Pennsylvania, Coveleski returned to the major league spotlight, enjoying three standout seasons for the Detroit Tigers from 1914 to 1916. The undisputed anchor of the league's most beleaguered pitching staff, Coveleski won 20 or more games and pitched at least 300 innings in three consecutive seasons. "Other pitchers on the Tiger club may grow wild and given an unbelievable number of free passes to first," John J. Ward noted in Baseball Magazine during the 1916 season. "Others may be hit to all corners of the lot; but Coveleskie, though he has his off days like all the rest, is a steady, consistent performer whose work is uniformly good." Coveleski was born Harry Frank Kowalewski on April 23, 1886 in Shamokin, Pennsylvania, one of five sons of Polish immigrants Anthony and Ann Kowalewski. Like his younger brother Stan, when Harry entered professional baseball he anglicized his name to Coveleskie--the final "e" was not dropped until after his retirement. Anthony Kowalewski worked as a coal miner in Shamokin, and like his brothers Harry left school at the age of 12 to work in the mines, where he worked as a slate picker for $3.75 per week, also gaining the nickname "Donkey Boy" because he was responsible for driving the mules that carried supplies into and out of the mines. Given the grueling nature of his work, one would expect Coveleski to have been more eager to escape the mines. In fact, he fell into professional baseball almost by accident. While he was pitching for the Bunker Hills, a sandlot team in Shamokin, a scout for the St. Louis Cardinals spotted the left-handed Coveleski and signed him to a contract for Kane (Pennsylvania) of the Inter-State League in 1907. The league disbanded after Harry won four and lost seven. He then joined the independent Wildwood, New Jersey Ottens, where his brother John played the infield. His performance in New Jersey was impressive enough to catch the attention of the Philadelphia Phillies, who signed Coveleski to a $250 per month contract on September 3, 1907. Harry appeared in four games for the Phillies that year, pitching twenty innings and allowing no earned runs. Standing six feet tall and weighing 180 pounds, Coveleski initially threw with a sidearm motion. At the beginning of the 1908 season, the Phillies optioned the young left-hander to Lancaster of the Tri-State League, where Coveleski converted to an over-the-top pitching motion. The change paid immediate dividends, as Coveleski enjoyed a banner season for Lancaster, finishing the year 22-15 with 232 strikeouts in 304 1/3 innings. Near the end of the season, the Phillies recalled him, whereupon Coveleski forever etched his name in the game's lore by beating the injury-depleted New York Giants three times in the span of just five days. On September 29, with New York tied for first place, Coveleski tossed a six-hitter at the Polo Grounds, shutting out the Giants 7-0. Two days later, Harry allowed only four hits against the Giants, winning 6-2. Promised $50 by Manager Bill Murray if he'd work against the Giants again on October 3, Harry accepted the assignment against Christy Mathewson and won, 3-2, knocking McGraw's club into third place. The Giants did not go down easily. They had a runner on third in the ninth with nobody out, but Coveleski retired the side. The newly-minted "Giant Killer" had virtually single-handedly prevented the Giants from capturing the National League pennant. Assessing the youngster's stuff after the season, Chicago Cubs pitcher Rube Kroh told The Sporting News that Coveleski, "has plenty of speed, all that any pitcher wants, and he has a great curved ball. His fast ball has a jump on it." Despite his extraordinary showing at the end of the 1908 season, Coveleski failed to pay off on his considerable promise. Over his next two seasons in the National League, the "Giant Killer" won only seven more games, just one of them against the New York Giants, as arm troubles limited his effectiveness. After going 6-10 in 1909, Coveleski was dealt to the Cincinnati Reds. Harry only lasted one month into the 1910 season before Cincinnati optioned him to Birmingham of the Southern Association. The Reds recalled Coveleski in September, but the lefthander was shelled in two of three starts and sold to the Southern Association's Chattanooga Lookouts at the end of the season. In Chattanooga, the lefty rediscovered his game over the next three seasons. In 1913, Coveleski pitched 32 complete games for the Lookouts, including seven shutouts, en route to a 28-9 record with an ERA well under 2. Branch Rickey of the St. Louis Browns tried to land Coveleski, but the Detroit Tigers beat him to the punch, purchasing the left-hander's contract for the 1914 season. Coveleski, presumed to be washed up four years earlier, surprised the baseball world with his 1914 comeback, finishing second in the league with 22 victories and leading the Tigers staff with a 2.49 ERA in 303 1/3 innings pitched. During his days in the minor leagues, Coveleski had developed a reputation as a pitcher who could be thrown off his game by taunts, and throughout the 1914 season teams tried to unnerve the lefthander by humming the song, "Silver Threads Among the Gold." Though the reasons behind Coveleski's aversion to the song were never revealed, according to the Washington Post the New York Yankees performed this routine to excellent effect. "For a few innings [Coveleskie] performed in great style," the Post reported of one contest. "And then of a sudden there came from the Yankees' bench: 'Darling, I am growing old/Silver threads among the gold.'" When Coveleski looked up, "the singing ceased. When he took up pitching again it resumed. Sometimes the strains came in solo order. Then it was a duet. Now it rolled out in a chorus....The air became filled with the music--and Coveleskie was through for the day." Despite the taunts, in 1915 Coveleski put up another good season, almost identical to his 1914 effort, winning 22 games and posting a 2.45 ERA. In 1916 he was even better, as his 1.97 ERA ranked fourth in the league and he pitched a career-best 324 1/3 innings, finishing the season with a record of 21-11. For the three year span of 1914-1916, Coveleski had won 65 games against only 36 defeats, and tossed 940 1/3 innings. The heavy workload proved too great for his well-traveled left arm, however, and, according to newspaper reports, his wing "went back on him" during 1917 spring training. Coveleski struggled through 11 starts, winding up with a record of 4-6 before he was shelved for the season. He managed only one start in 1918 before drawing his release. In the ensuing years, Coveleski tried to extend his playing career in the minor leagues, making several unsuccessful comeback attempts with Little Rock; Altoona, Pennsylvania; and Oklahoma City and McAlester, Oklahoma. In 1922, he accepted a job as a plainclothesman for Ford's River Rouge plant in Michigan. Two years later, he returned to Shamokin, where he lived with his wife, the former Cecilia Glassie, and their only child, William. In 1926, he began a four-year stint with the Shamokin police force. After leaving the squad in 1930, he operated a café, and was fined for serving alcohol in violation of the prohibition laws. To pay off the fine, Harry took a job as a watchman in a silk mill, eventually earning enough money to once again open his own place, a tavern he called "The Giant Killer." Coveleski passed away on August 4, 1950 at the age of 64. He was buried in St. Stanislaus Cemetery, in Shamokin. William C. Kashatus. Diamonds In The Coalfield. David W. Anderson. More than Merkle. Bill Francis and Gabriel Schechter, at the Baseball Hall of Fame Library. Marc Okkonen, for tip on April of 1909 matchup of the Coveleski brothers.